Delicious Fleece Artist sock yarn in the colorway “Jester” arrived on Saturday, kindly donated by the lovely Allison of the Simply Sock Yarn Co. for a Socktoberfest prize. Go visit her – she’s got some seriously great sock yarn, and she included a very nice hand-written note with the yarn. Norma mentioned the excellent personal attention many small yarn stores give, and SSYC is definitely among them! This yarn couldn’t be a more glorious autumnal range of colors. I’m extra glad to have it, as you can see the pathetic effort my tree has made thus far. This is the Twisted Float cardigan by Annie Modesitt from Fall ’05 Vogue. I began it in my class (we interrupt this message to let you now that it is doing lightning and thunder and rain outside right now. Thunderstorms in November? Huh?) with Annie at The Point on Friday night, and on Saturday I could hardly put it down. The construction makes it a totally fascinating project, and it’s as good a use of variegated yarn as I’ve seen. I’m making a child-size version and eliminating the boucle trim in favor of a simple picot edge. I love the yarn: Lorna’s Laces Shepherd Worsted in “Seaside” (and it really does make me nostalgic for the sea – these are the colors of my home) and the sea green remnants from Lisa’s beautiful clapotis. Yep, that’s me with a drop spindle and some forebearing Romney! Marie very kindly loaned me her extra spindle and a little pile of roving to practice with, and then she showed me the ropes. The “yarn” I made is utter crap, of course. But I’m learning, by golly! Soon I’ll get the hang of it…not that I have time for another addiction, especially with Christmas looming so menacingly and so much gansey left to knit. We’ll end with a gratuitous cat picture, just because. It’s knitting related, though: we’re reading our new copy of Nancy Bush’s Knitting Vintage Socks. Ah, happiness. Yes, my friends, here you see the maiden voyage of HMS Swift, winding her very first 500-yard skein of Brooks Farm Duet. As this operation went swimmingly, she proceeded to wind the rest of the Rhinebeck haul and then all of Lisa’s Rhinebeck yarn. Swifting is so pleasurable that I would have gladly wound about eight times as much yarn for Lisa free of charge, but she traded me the Lorna’s Laces Shepherd Worsted she had left over from her Clapotis. I’d been eyeing it for the class I’m taking tonight – my very first knitting class, and it’s with Annie Modesitt! 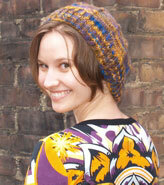 I’m going to learn combination knitting and how to create circular fabric. The project is the circular cardigan on the cover of the Fall issue of Vogue, which I quickly dismissed as Not My Bag. But then I got to thinking that the construction was really pretty neat and easily applicable to other garments, so I started imagining a toddler-size version in entirely different colors with a simple picot edge instead of all that boucle. So I’m going to see what I can do with Lisa’s sea green yarn and a couple of beautiful skeins in the colorway Seaside. Wish me luck!